Forest and land fires in Indonesia's Central Kalimantan province have intensified in recent days with strong winds carrying the haze for the first time this year across to Sulawesi island to its east. Central Kalimantan is one of the two worst-hit provinces during this year's haze season in Indonesia, the other being South Sumatra. Most Indonesian farmers and plantation firms opt to clear land by burning it to make way for planting, ahead of the rainy season that should have started in October but was delayed due to the El Nino phenomenon. The spreading fires in Kalimantan come as massive firefighting efforts for the past week, with international help, have been focused on South Sumatra province. The Pollutant Standards Index (PSI) in Palangkaraya, capital of Central Kalimantan, reached a peak of 1,889 last Friday at 9am before going down to 1,063 at 10pm the same day. Any measure above 350 is considered hazardous. PSI readings for yesterday were not available. In Palembang, capital of South Sumatra, the PSI went up as high as 475 on Friday at 9am and improved slightly to 379 at night. Haze from fires in Sumatra has regularly blown across the borders to Singapore and Malaysia, due to geographical proximity. The focus of the water-bombing operations in Central Kalimantan has been Pulang Pisau, Kapuas and Seruyan regencies, where most of the hot spots are, said Ms Rani Anggraini of the Central Kalimantan governor's office. Another regency, Katingan, is easily reachable by ground firefighters. Two water-bombing aircraft stationed in Palangkaraya were recently moved to Pangkalan Bun, about 260km to the south-west, as thick haze in Palangkaraya had prevented take-offs, said Mr Tri Budiarto, a deputy chairman in charge of emergency response at the national disaster management agency (BNPB). Another aircraft from Palangkaraya was moved to Banjarbaru, some 150km to the south-east, according to Mr Tri, who was in Palangkaraya yesterday, where he spoke to The Sunday Times by phone. "We have seen a concentration of haze building up in the past three days over Kalimantan. Fires were emerging on the left and right of the Trans-Kalimantan road as we drove through Pulang Pisau on Friday," he said. He said the prevailing winds were blowing the haze from the surrounding burning land to Palangkaraya, which had very thick haze yesterday. The winds, blowing from west to east, had also caused the haze over Kalimantan to travel to Sulawesi last Friday and yesterday. On the situation yesterday, Ms Rani said: "Fires had been put out but re-emerged and the winds were very strong on Friday, allowing the fires to spread faster." 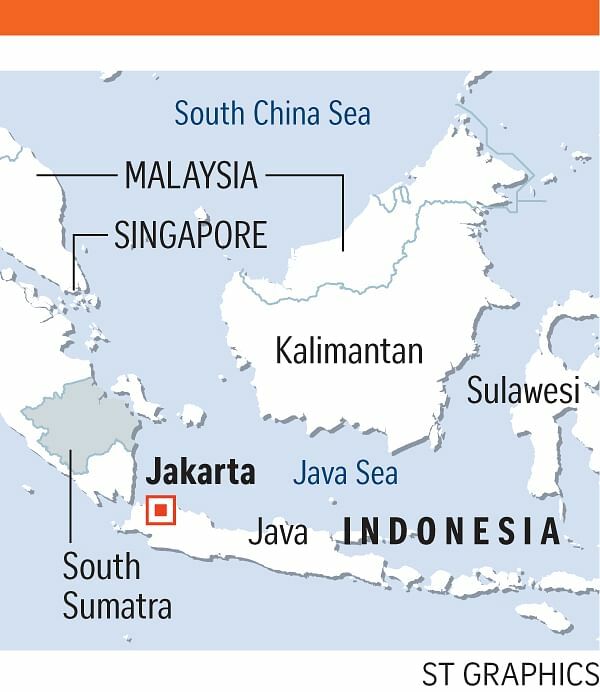 "We are asking Jakarta to send in two more water-bombing choppers. Early last week, two water-bombing aircraft arrived here to add to the existing ones."